It was a frigid 5 degrees under a brightening morning sky when I backed the bird-mobile out of the garage, pointing it north on highway 22/3, and drove towards Caesar Creek State Park. Within 2 minutes I had my first new bird for my January 100 list, a Pileated Woodpecker hammering away on a short tree by the side of the road. I’m hoping this is a good omen. 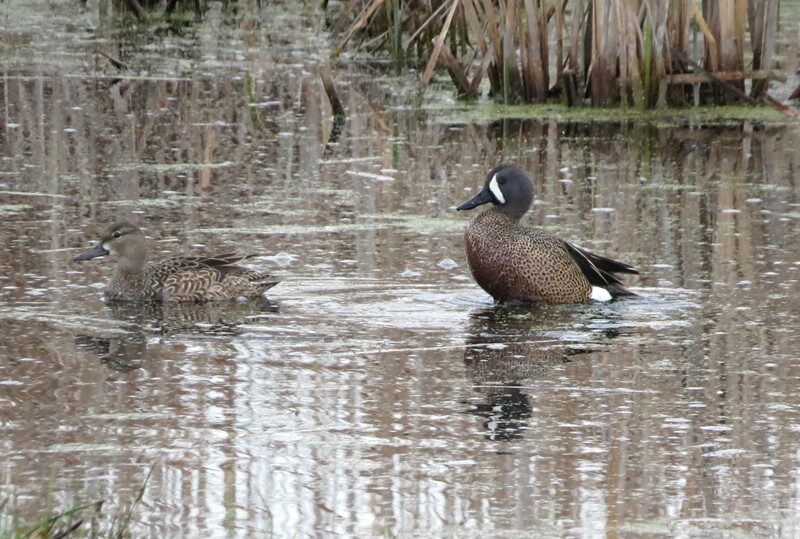 There’s loads of common birds I still need to check off at Caesars Creek and nearby Spring Valley Wildlife Area. Normally my first stop would be at the Harveysburg Road overlook, but today I made towards the beach in hope of finding the gull flock still on the beach before they disperse to feed. 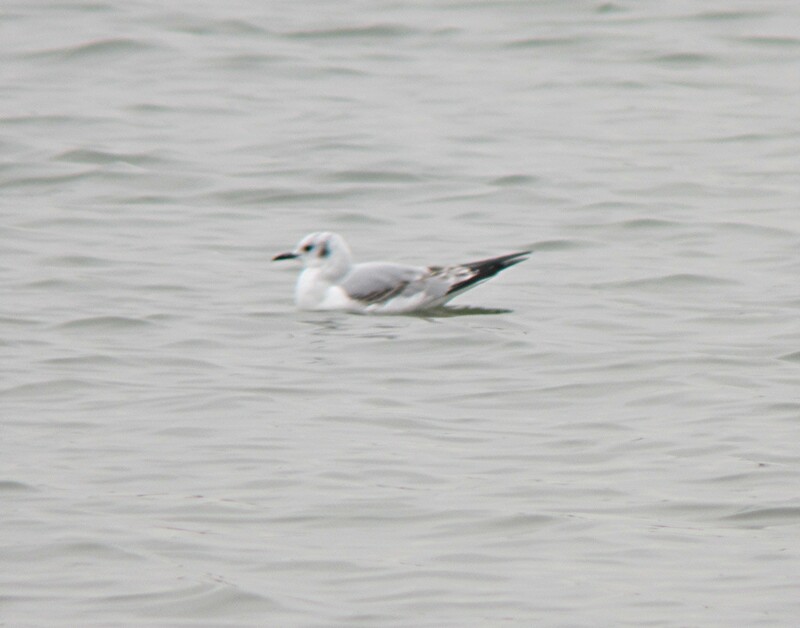 I found the flock without any problems and right in the middle was my Herring Gull. 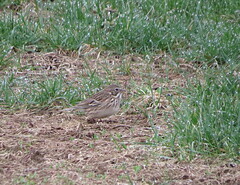 I continued to scan the area for Killdeer and Pipits without any luck. I drove to various points around the lake scanning for any signs of waterfowl, and if it wasn’t for 2 Pied-billed Grebes the duck decoys left by hunters which was the most numerous thing on the lake. I packed it i and headed over to the visitors center to warm up and check the feeders. The feeders at the visitors center usually draw your normal birds like Junco’s, Cardinals, Titmouse, and Chickadees. In the winter though for the past several years I’ve had very good luck in spotting Purple Finches at this location. During the Spring and Summer of last year the visitors center went through a large expansion so now they have 2 areas set up with feeders that you can watch from inside. The visitor center expansion consisted of a long corridor with several offices connecting the original visitor center building to a large conference room. One of these offices along the corridor was open to the back of the building and the feeder area. Taking off my coat and hat I settled into a chair and held vigil. After about 5 minutes a stunning male flew in. I apologize for the poor quality, since I was shooting through a window and the sun was at a low angle. I love how Peterson describes them in his field guide, “a finch dipped in raspberry sauce”. Despite some peoples confusion between this species and the more common House Finch, once you see a Purple Finch next to a House Finch the difference becomes quite obvious. 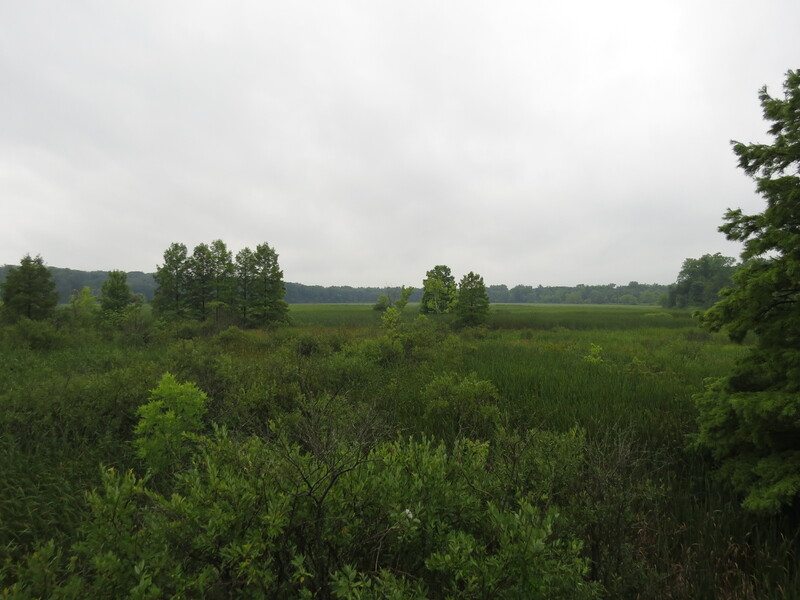 The rest of the morning and early afternoon was spent checking out Spring Valley and a few gravel pits. It was during my drive to Spring Valley when I FINALLY spotted 3 large black birds soaring. Pulling off the highway and getting my bins out I saw that they were Black Vultures. All I need now are Turkey Vultures. My grumbling stomach told me it was time to leave. Driving slowly I noticed a really small bird flitting about low in the branches of a tree by the side of the road. Stopping I got my bins on it to find a Golden-crowned Kinglet. Pulling to the side of the road I grabbed my camera in what I thought would be a futile attempt to get a picture of these ever moving birds. Luck was on my side today. Rails are notorious from being secretive and skulking. 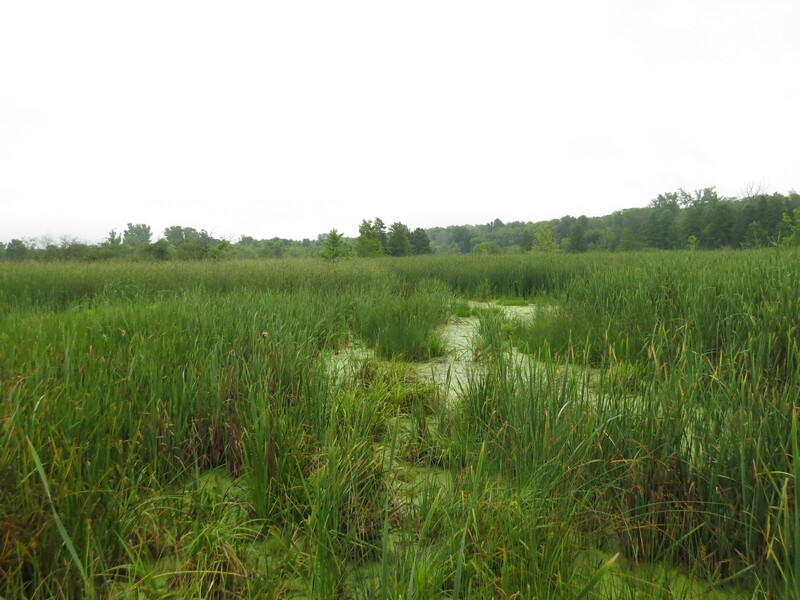 Normally we tend to hear them as they call from the tall reeds and grasses of marshes. As birders we home in to their call or grunts and wait patiently as we watch the grasses twitch and move as the move about, never showing themselves unless absolutely necessary. At times we do get lucky and catch one out in the open or along the edge of the cattails, as was the case yesterday. 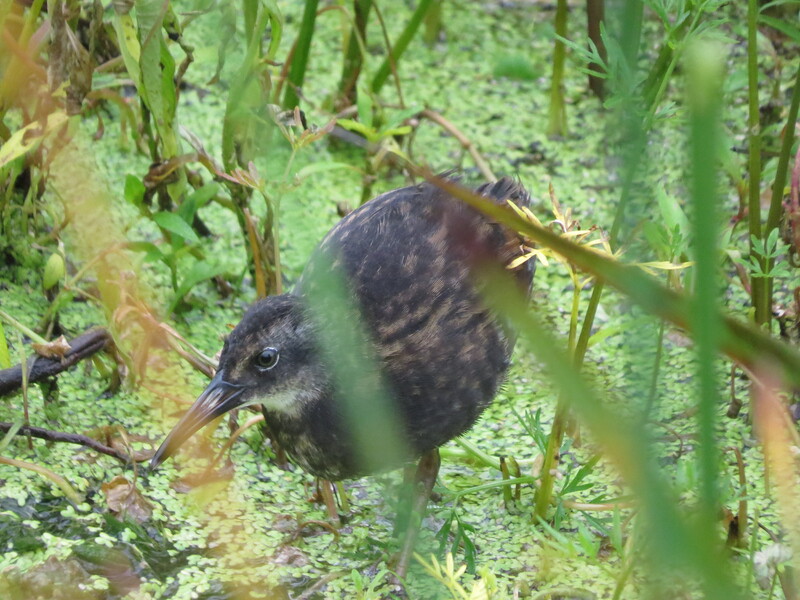 As I stepped onto the boardwalk at Spring Valley yesterday morning the first of 2 Virginia Rails raced off into the grass never to be seen again except for the “grunts” they vocalize. 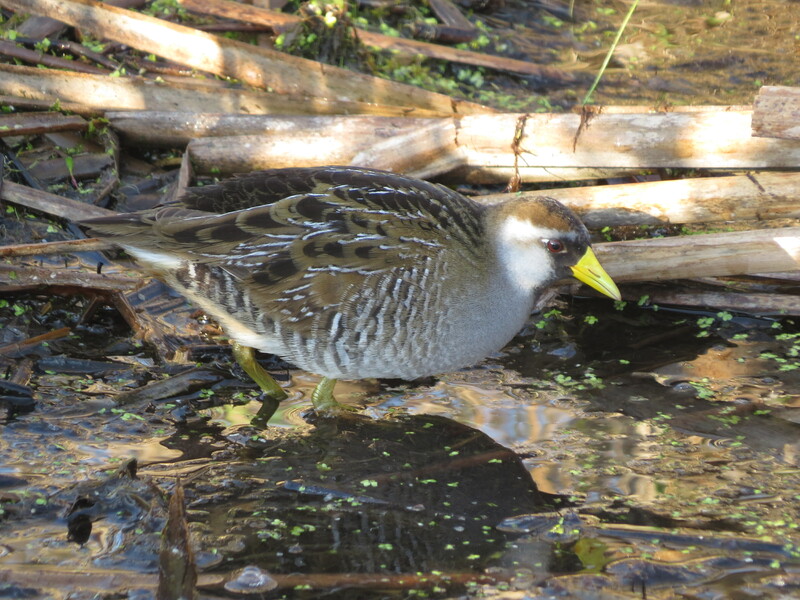 Angry at myself for spooking one off and missing a great photo op, I satisfied myself photographing a Sora that was feeding along the edge of the grass, never venturing out too far as these are really spooky birds and will dash back into the thicket in a blink. Not my best effort, but diagnostic. 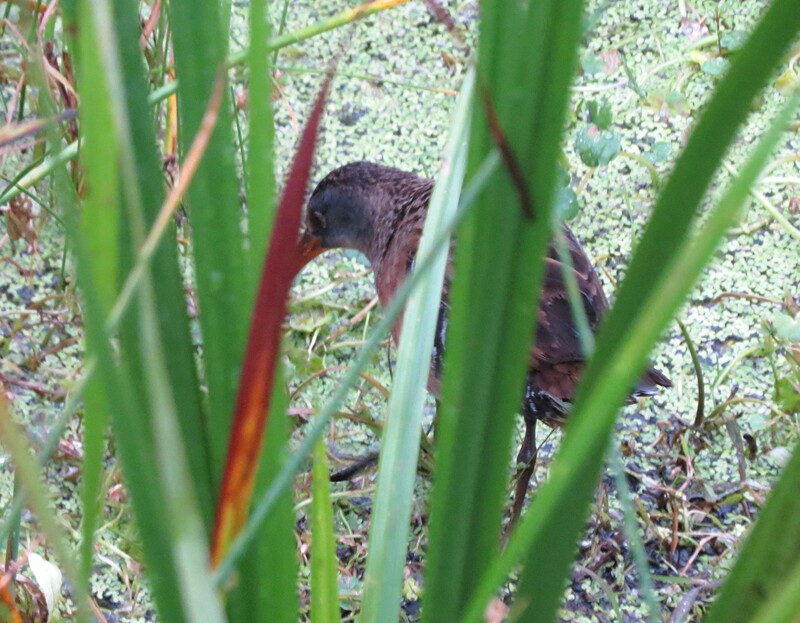 As I was growing weary chasing the Sora for the best angle to photograph a Virginia Rail close by started to “Grunt”. I followed the call. Spotted the bird. Crept closer. Now here’s a exceptional effort. 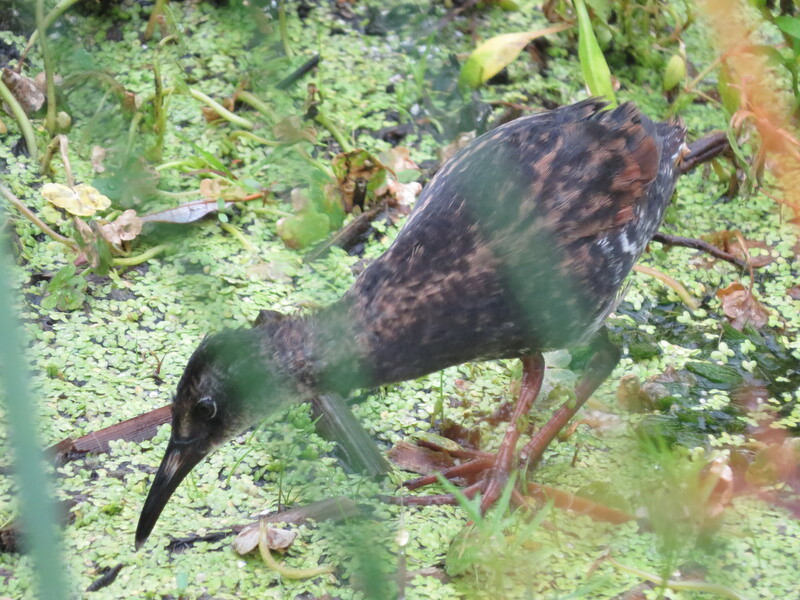 I’ve tried for years to get a decent photograph of a Virginia Rail, and yesterday was that day. 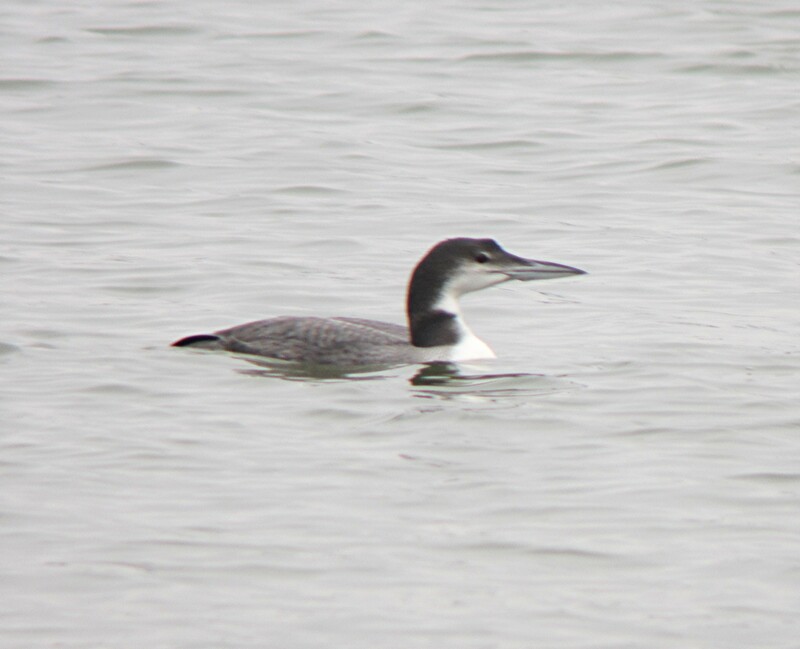 Despite the beautiful weather last weekend, from a birding perspective it was a total bust. Previous obligations kept me close to home, and even though the temptation to go out was there, knowing ahead of time that this weekend was MY weekend made up for the lost time. 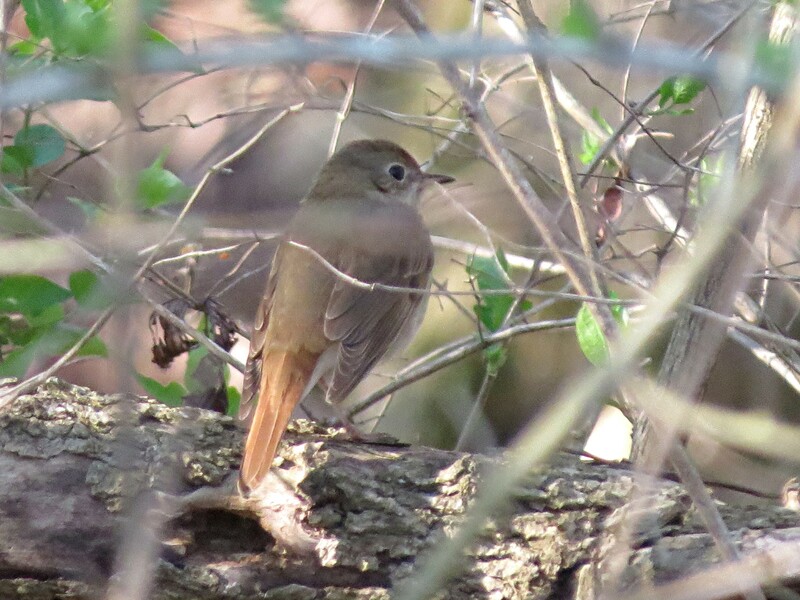 It’s Spring, and migrants are on the move! 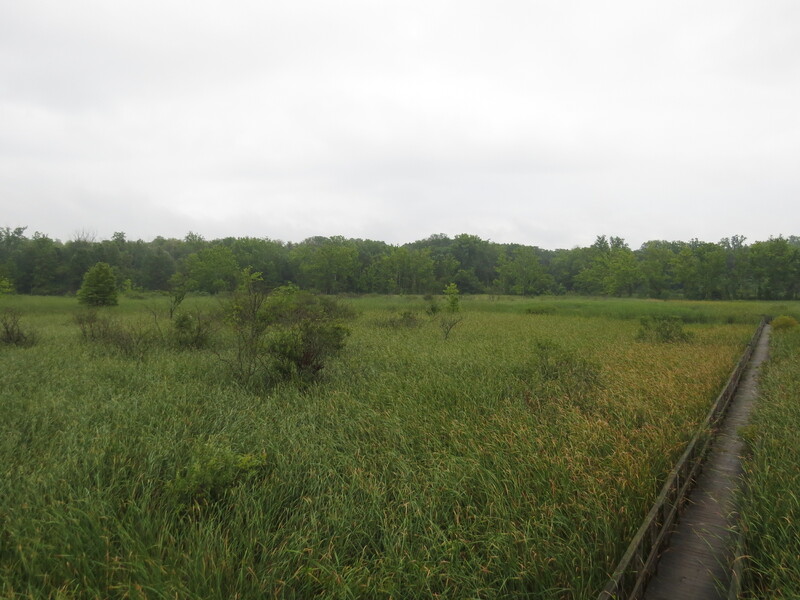 I had a pretty good idea where I wanted to visit, and the first place was Spring Valley Wildlife Area. Sleeping in wasn’t an option as I drove prior to the sun rising to be on the boardwalk bright and early to catch any Rail action. 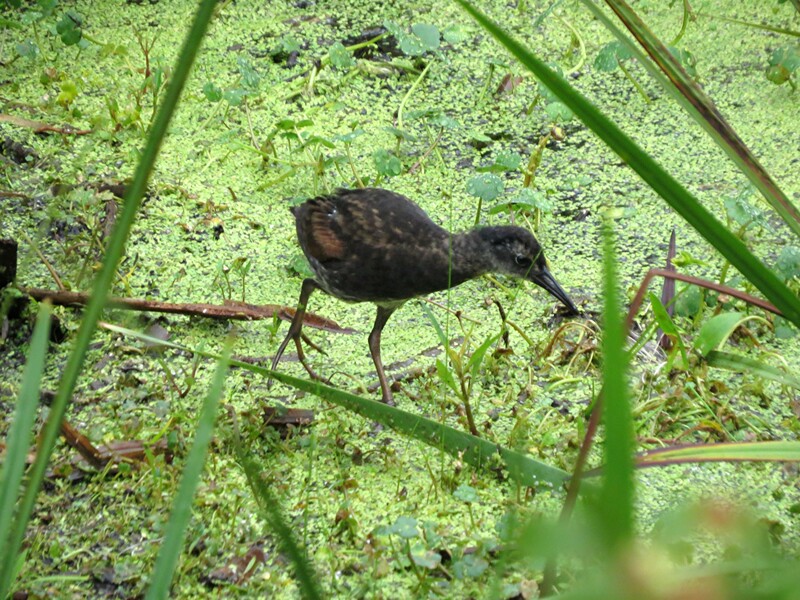 Spring Valley is noted for Soras and Virginia Rails, and today I wasn’t picky which showed up. And it was the Soras that showed off and kept me on my toes with camera in hand. 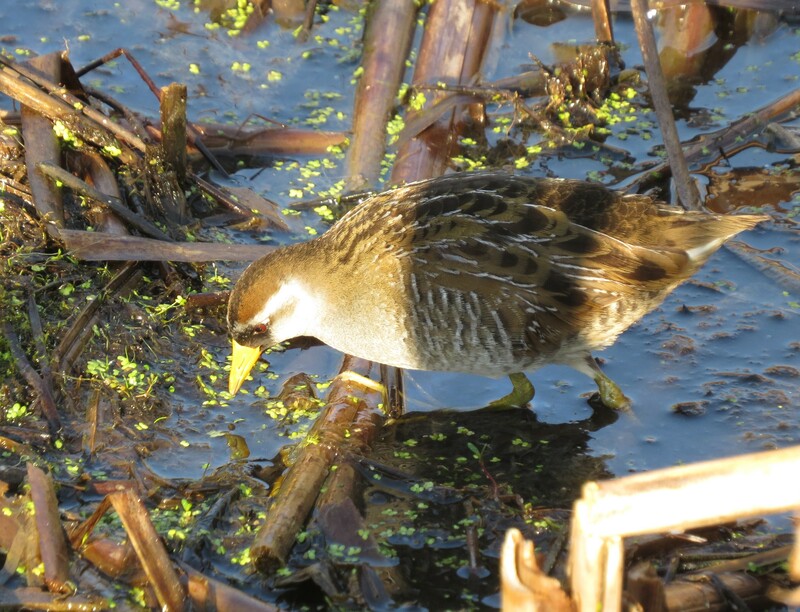 It wasn’t till I started to walk back from the observation platform that I noticed it’s tell-tale yellow bill amongst the brown and green of the background. 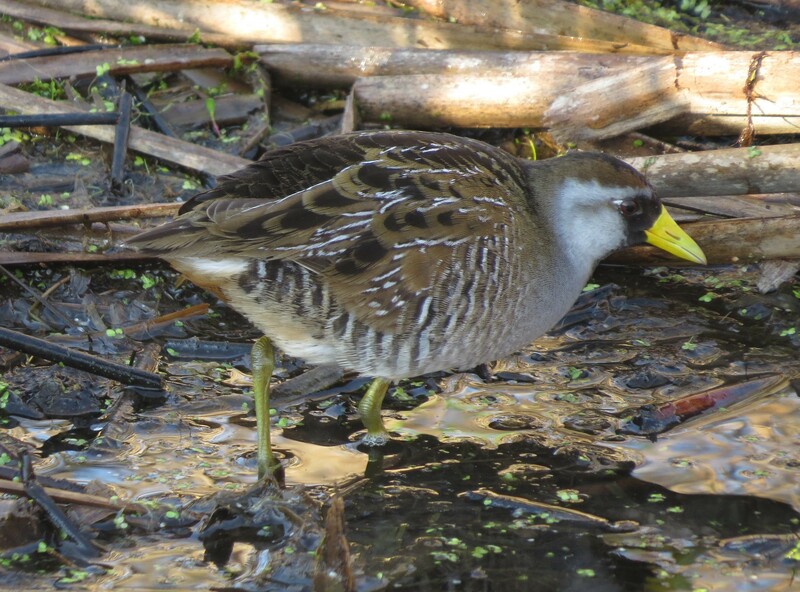 As the Sora moved about feeding i had to wait for the right time when the bird was out in the open to capture any photo. As usual I had to discard more photos than i kept. Even with rising sun behind my back, photographing this bird as it darts in and out of the shadows can prove difficult. 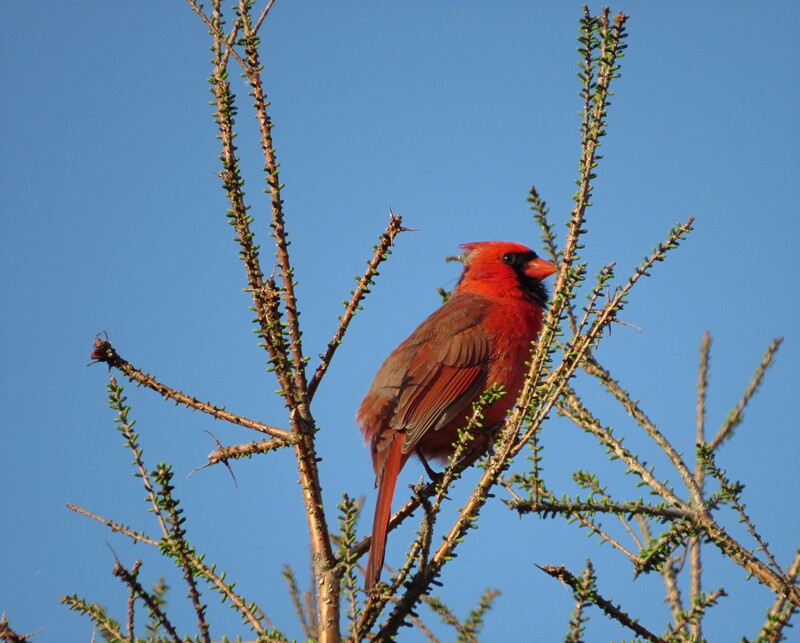 Even though it’s just a Northern Cardinal, I love the contrast between the blue sky and the red of the bird. 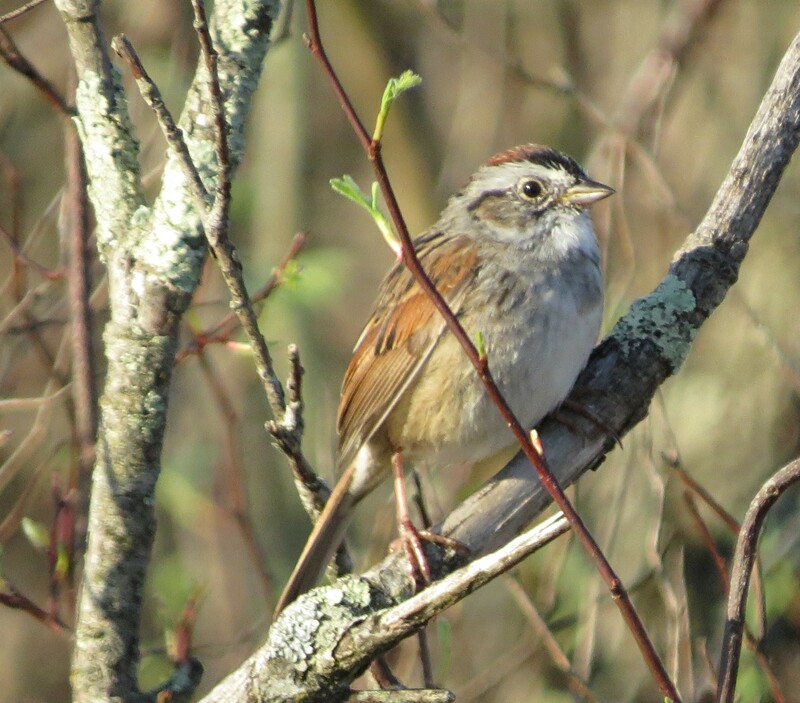 Another regular of Spring Valley is this Swamp Sparrow. Normally difficult to capture sitting up like this, but with it being mating season they were more exposed just singing away. 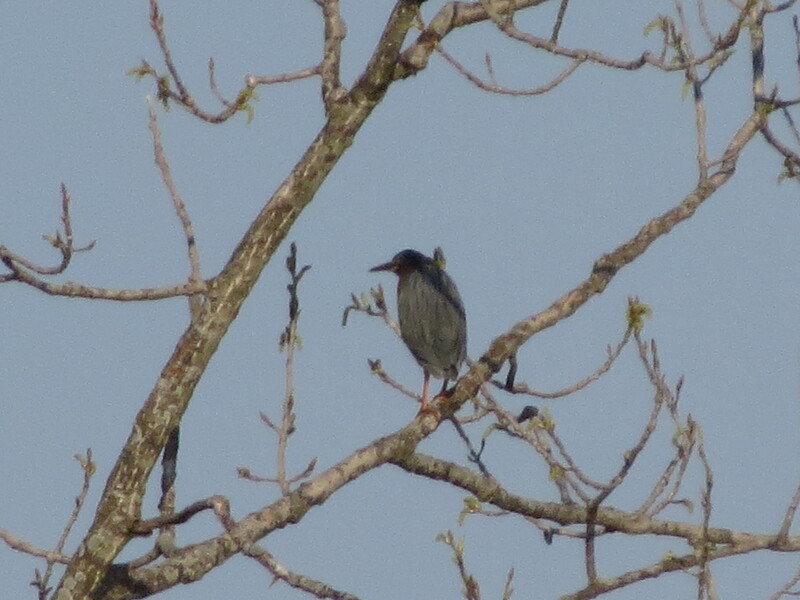 A very, very distant, first of the season Green heron. After leaving the boardwalk I drove to the other section of the park which gives you greater access to the Loveland bike trail. As anyone would expect bu=ike traffic was a little heavy, plus the foot traffic of plenty of birders made for a busy bike trail. This is a very nice section of the bike trail with mature trees and plenty of water on both sides. 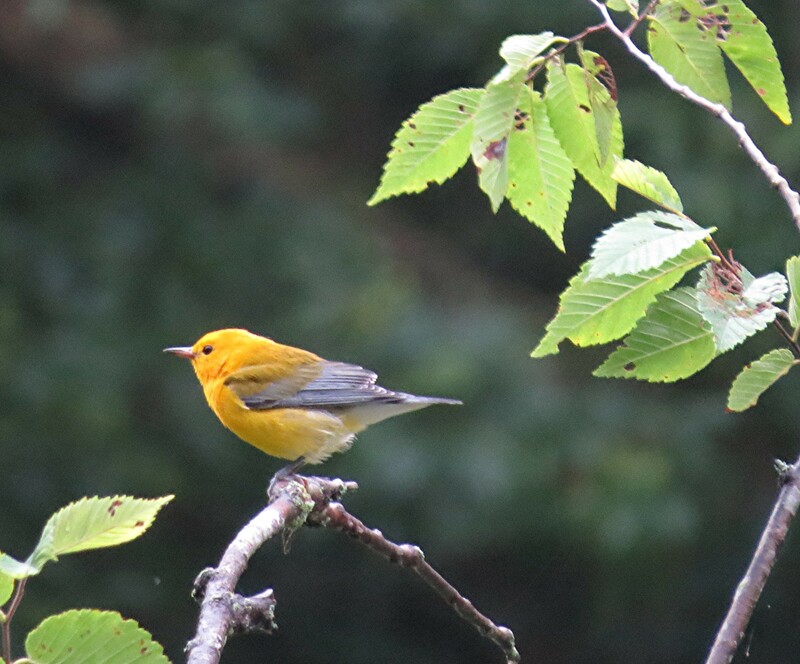 A very distant Prothonotary Warbler. It’s really difficult to get a sharp picture when using digital zoom and no tripod. 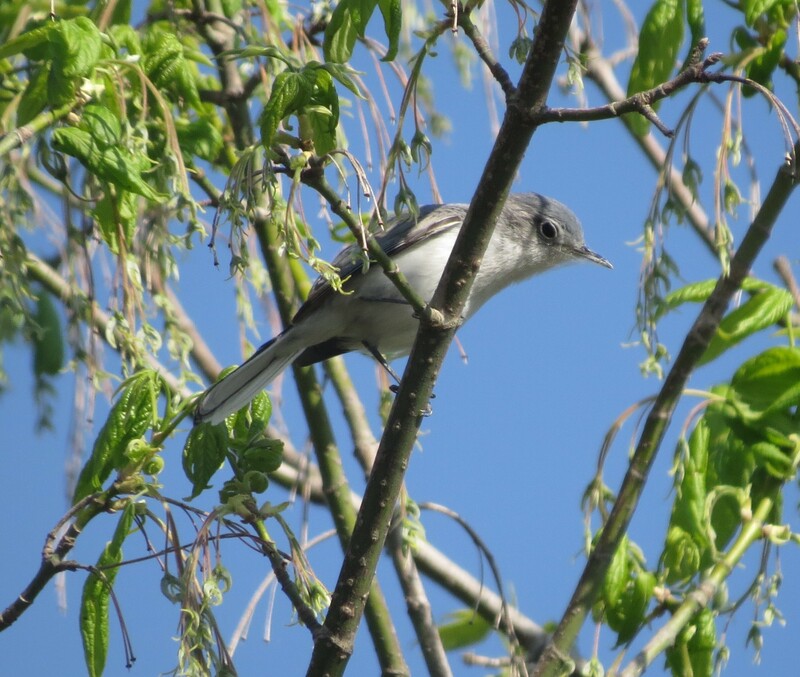 Blue-gray Gnatcatchers were everywhere. Trying to photograph these tiny hyperactive birds has proven difficult throughout the years, but yesterday I got a few. A quick shot of this Hermit Thrush before it hopped down and started to pick through the leaf litter on the forest floor. 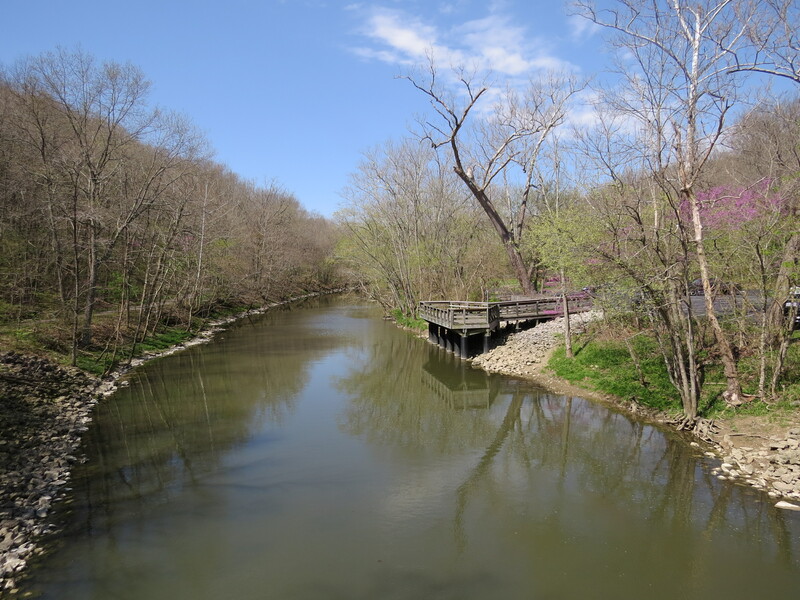 After Spring Valley I made the short drive to Caesar Creek Gorge State Nature Preserve. The preserve’s prime feature is the gorge that was formed by great volumes of glacial meltwater cutting down through the bedrock to expose Ordovician limestone and shale rich in fossils. The steep walls rise to 180 feet above the river. More than two miles of Caesar Creek flow through the gorge to the Little Miami State and National Scenic River. 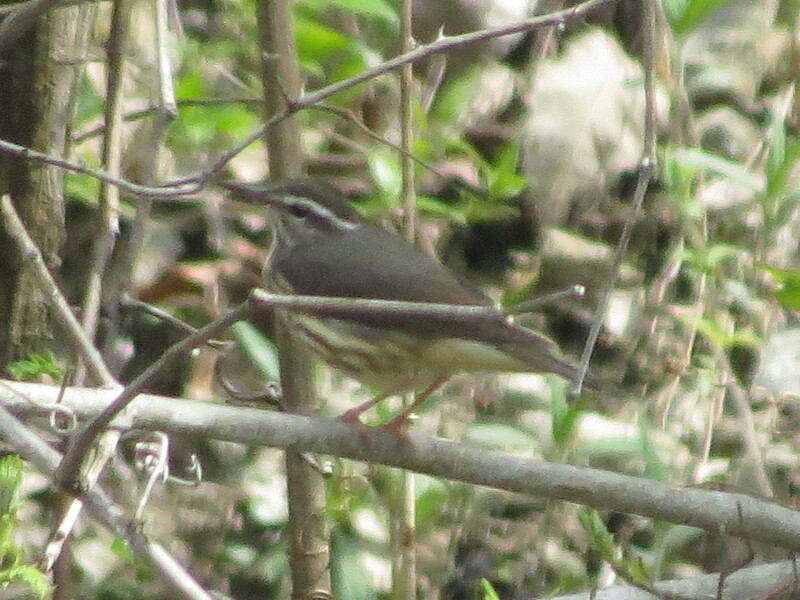 It has a 2.25 mile loop trail, and is my go-to spot for Louisiana Waterthrush. I had the whole place to myself. Someplace like this being totally empty except for yourself and the birds. It was about half way through the trail when it comes close to the river when I heard my first LOWA. The bird was the opposite side of the river and never got close enough for a good photo. I will return and try again in the near future. This photo is totally unsatisfactory. Now this morning the forecast called for rain starting late morning. 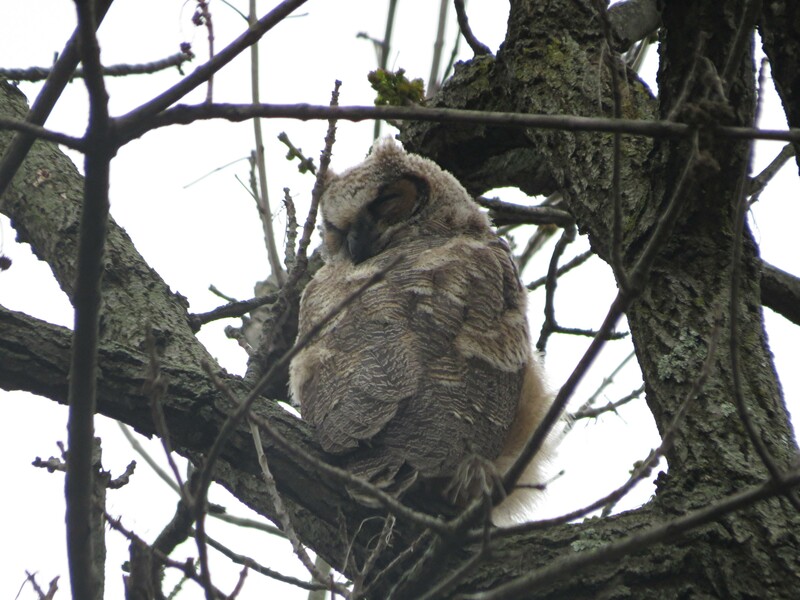 So once again I hurried through a couple cups of coffee on the front porch, and then drove to Gilmore Ponds to check on the great Horned Owls that have been nesting there. As a matter of fact someone was there yesterday and shared on Facebook a photo of one of the fledged Owlets. 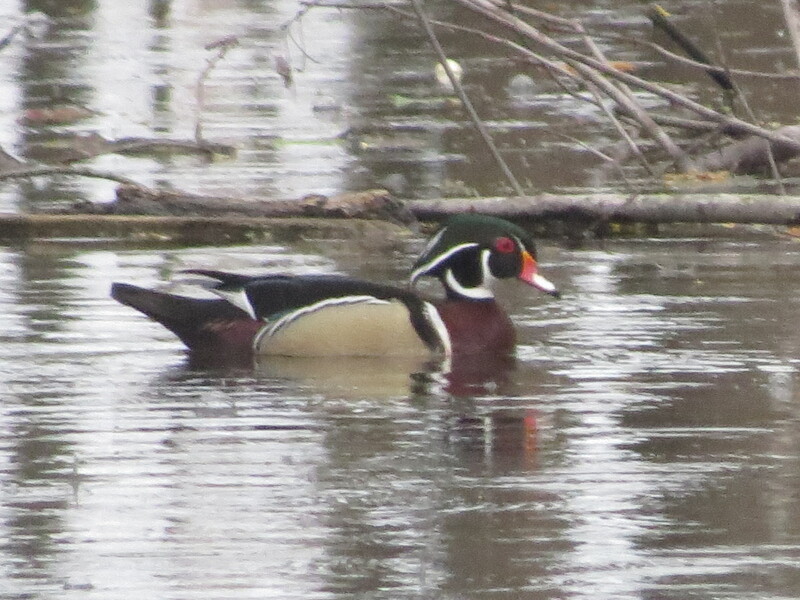 One of these days I’ll get a nice, clear photo of a male Wood Duck. I hiked back towards the nesting tree. As I got close I remembered last time both parents being close by and not wanting to spook them I paused and scanned the trees near the nesting tree for them. Not finding them I continued on. No Owls in sight at all. Kind of a bitter-sweet moment as I continued on down the path. Feeling confident they weren’t anywhere near I returned from where I came. I glanced to my left and there was one of the Owlets high in a tree with it’s back towards me. I took a quick photo just to get a confirmation shot, then I made a noise so it would turn it’s head. The rest of the morning was spent picking up more and more birds for the weekend. Then the rain came, thus ending a pretty good bird watching weekend. 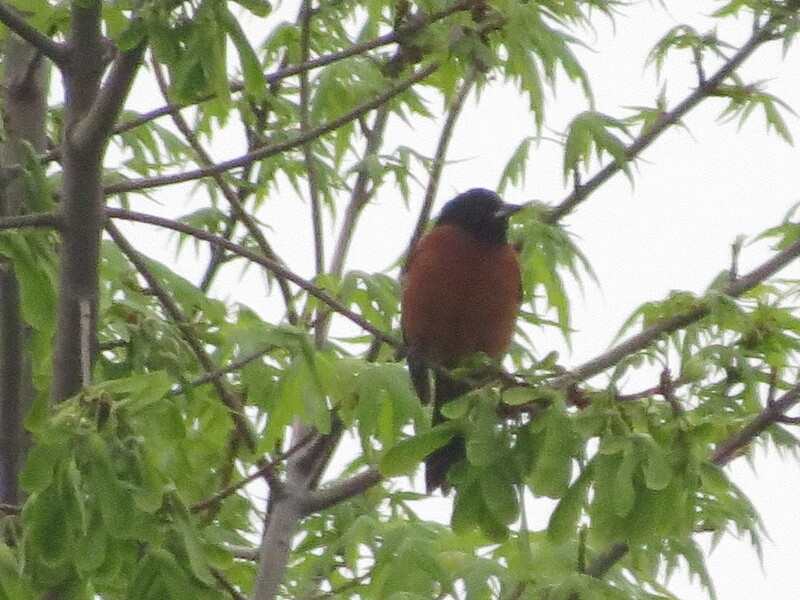 My first of the year Orchard Oriole. 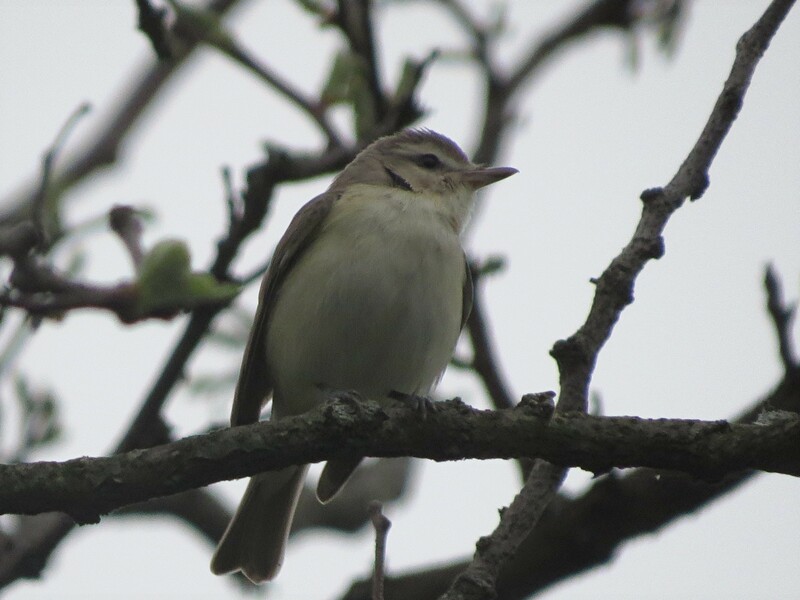 Warbling Vireo under a drab sky. 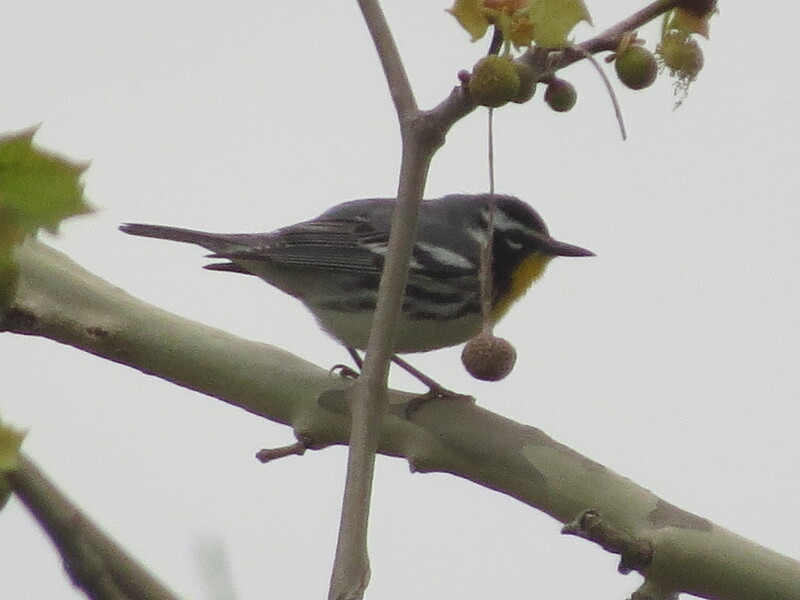 Here’s another bird I hope to get a better photo of, a Yellow-throated Warbler. I was anxious to go birding Saturday, more so than most other days. I felt kind of guilty that I hadn’t called Jon to see if he wanted to join me, but I thought that today I needed to be alone. Just myself and my new camera. Where I could take my time and not rush. This was more of a photographic adventure than a birding adventure. Now don’t take me wrong, I wanted to see some cool birds (which I did) however I really wanted to see how my new camera operated. The boardwalk out into the marsh at Spring Valley was pretty empty, except for a couple of photographers this cool Saturday morning. 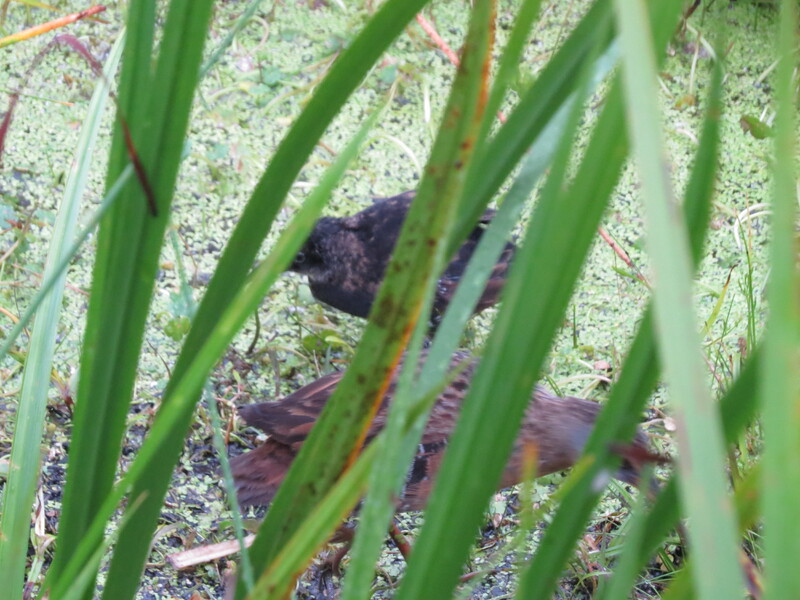 A couple of Soras were calling above the chatter of the Red-winged Black Birds as I waited to see if any Virginia Rails would call. 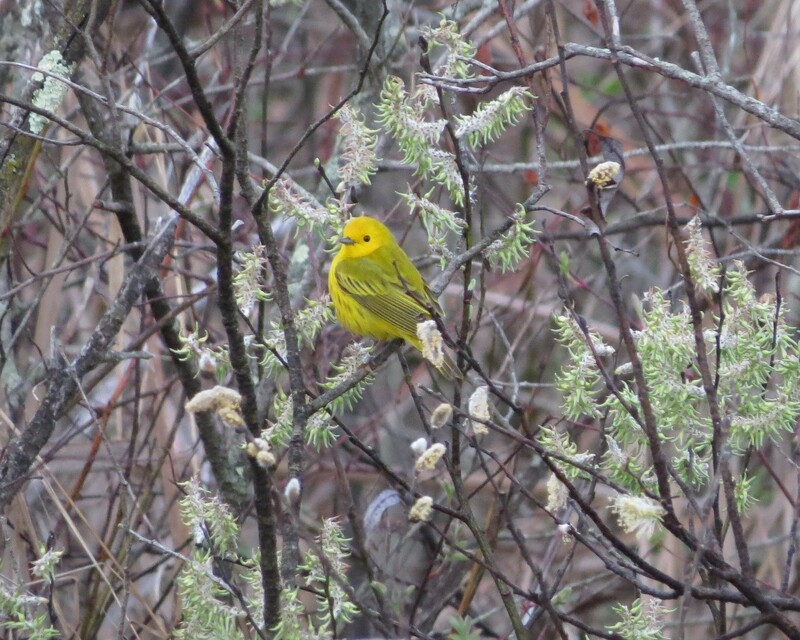 My first of the year Yellow Warbler flitted around the bushes out in the marsh. A small brown bird catches my attention. 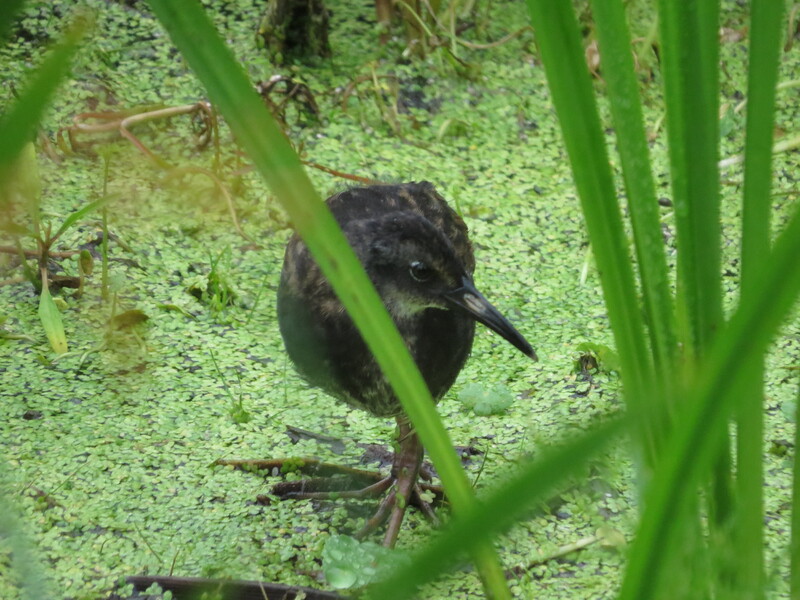 It’s down amongst the vegetation and cattails. 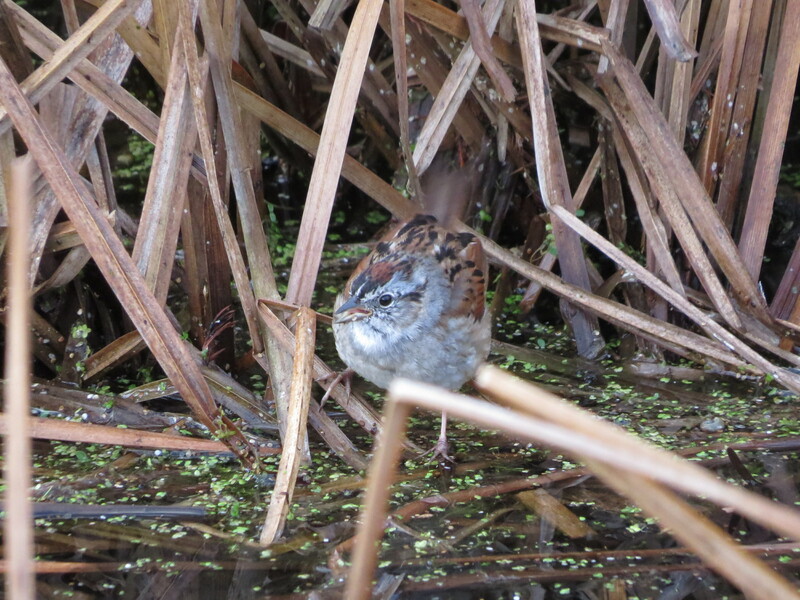 I was hoping for a Marsh Wren, but I will settle for a Swamp Sparrow. After the boardwalk I drove over to the other section of Spring Valley. This area is in close proximity to the bike trail and hopefully some warblers. 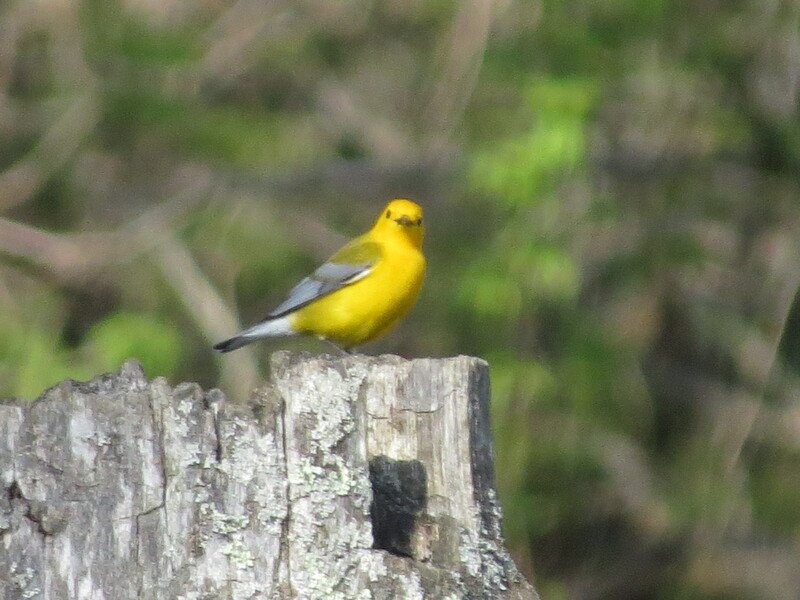 Palm, Prothonotary, and Yellow-rumped Warblers were everywhere. The morning was heating up and the activity on the bike trail was getting busy with bicycle traffic. 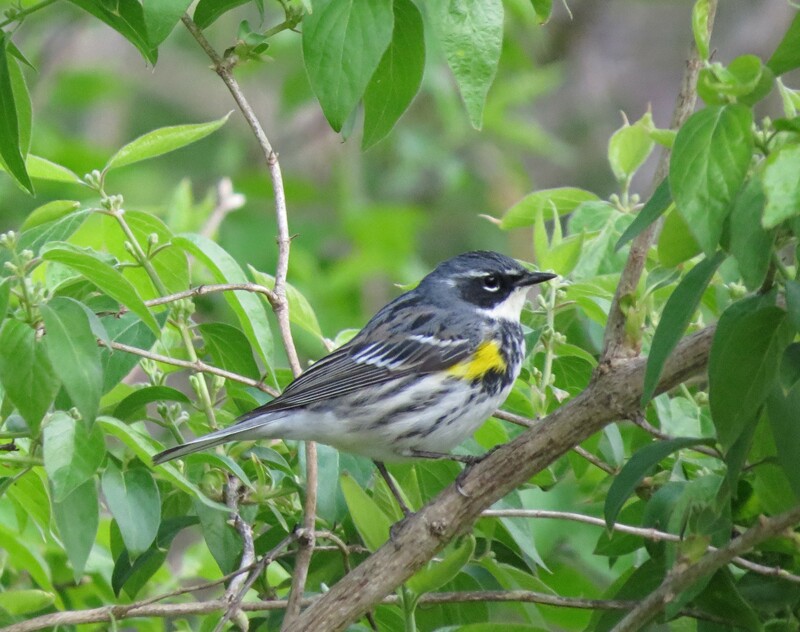 A beautiful male Yellow-rumped Warbler. 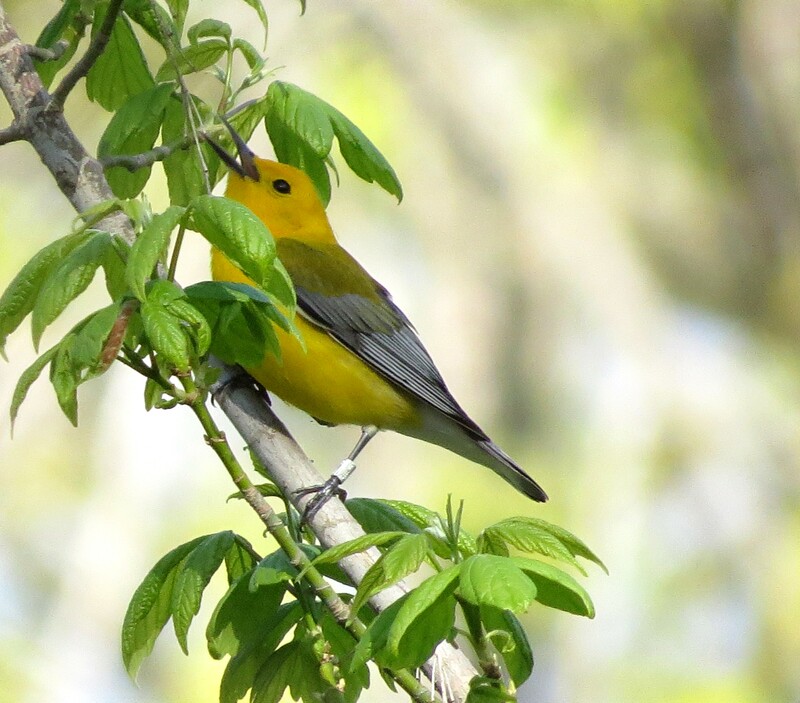 This Prothonotary Warbler was really skittish. When I first heard it sing, and was finally able to track it down, getting it’s picture was proving to be difficult. After getting a few good shots I was looking over the pictures at home. Now look on the birds leg. 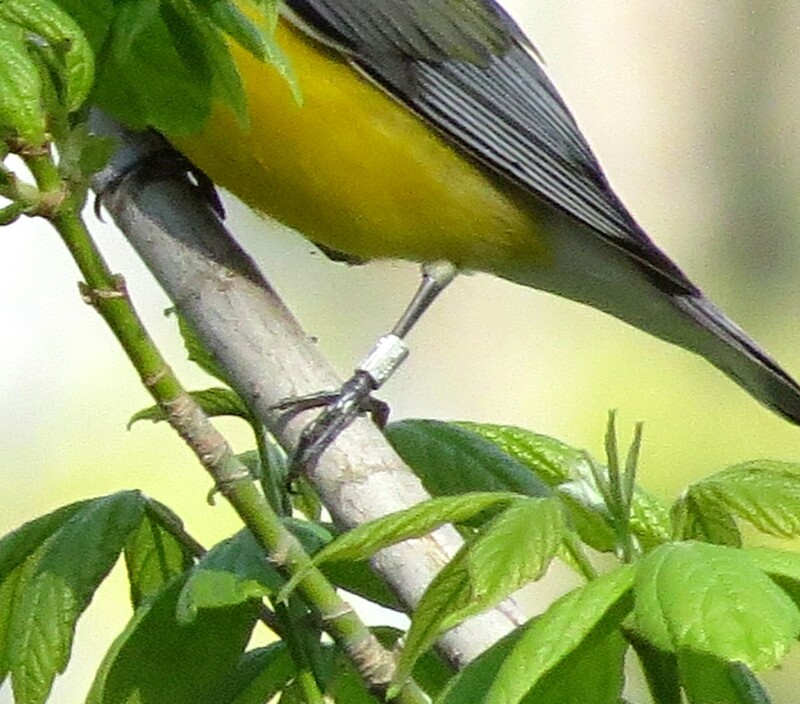 I think this is either my 3rd, or 4th bird photo where the bird is banded. After walking down the bike trail to check out a Bald Eagles nest, I made my way over to the area below the dam at Caesar Creek. 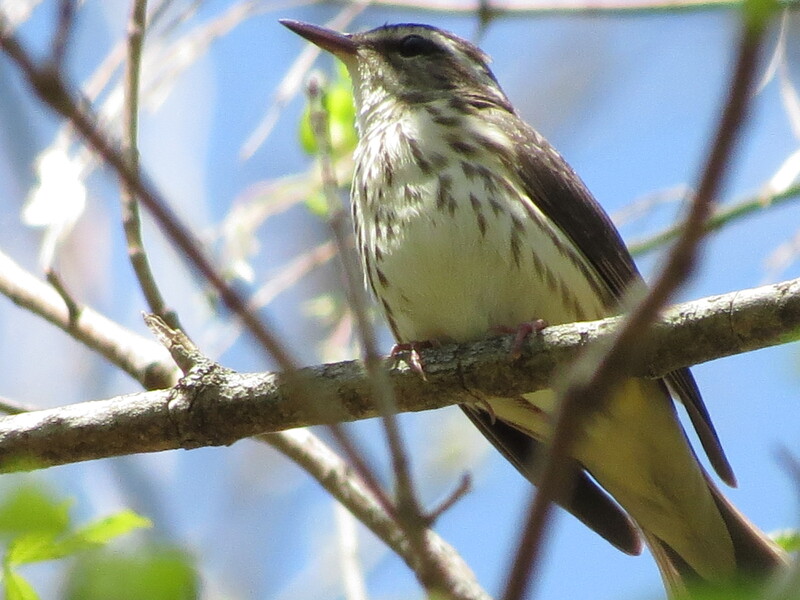 In the past I’ve heard of Louisiana Waterthrush being in the area. Being such a beautiful day this part of the park gets especially busy with families having picnics and folks fishing. 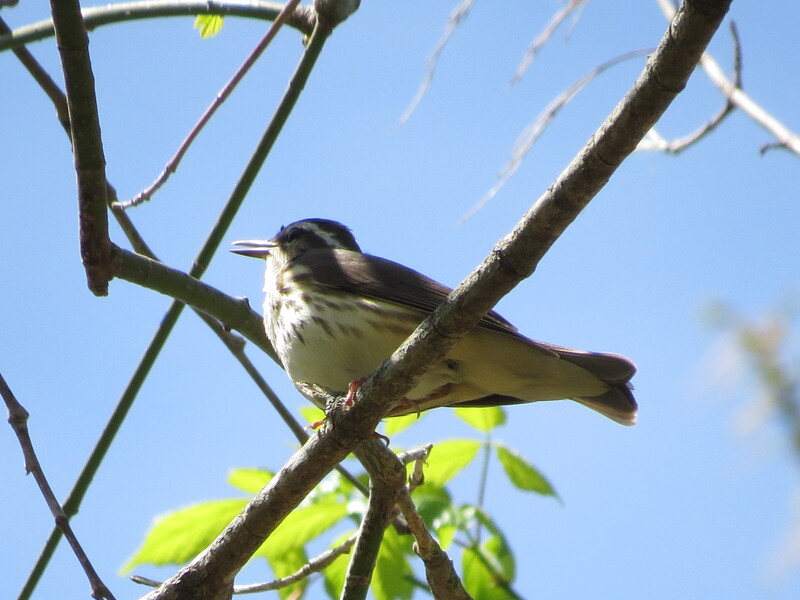 So I hiked around for a bit listening for any tell tale signs of a Louisiana Waterthrush. As with California Woods last week I struck out again. So it was time to change locations, and this time I’m going to follow the tail water from the dam downstream to Caesar Creek Gorge. 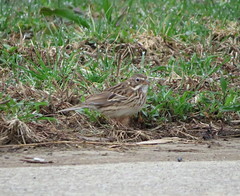 I’ve found the bird here before and last year a fellow birder reported a good spot to find them. So it was back to the car for the 20 minute drive. 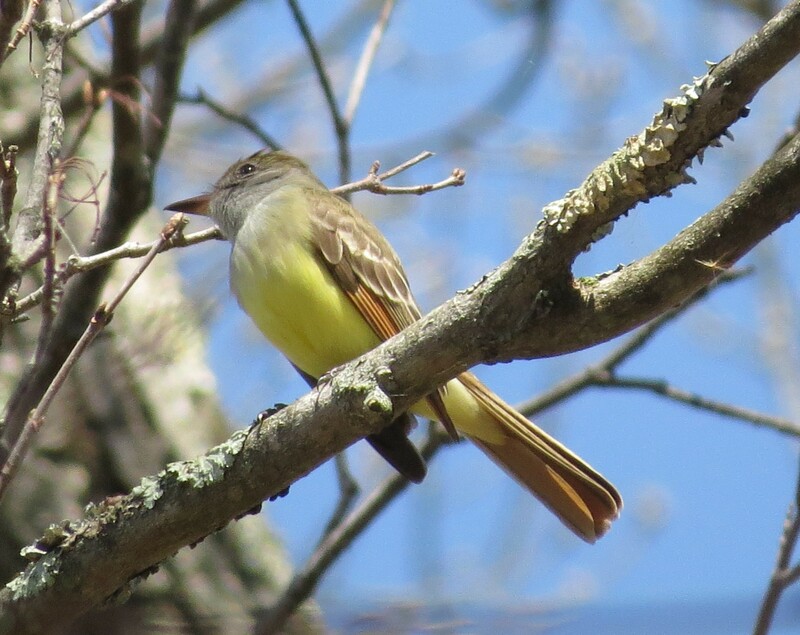 A Great-creasted Flycatcher is a wonderful bird. But what is so wonderful is how close this picture is to the bird. A picture this good alone justifies my purchase of this camera. I never would have been able to digiscope a picture this good. By the time I had everything ready the bird would have flown away. I made my way around the park and started my decent into the bottom land of the park that borders the river. The place I read about is a little off the trail but it was easily accessible with just a little scramble down a steep bank. The rush of the water is all I hear. A Spotted sandpiper lands on some gravel in the middle of the river. Pumps it’s tail a few times and flies up river, as does the Belted Kingfisher. Then I hear one sing. It keeps getting closer and closer. Right over head now. 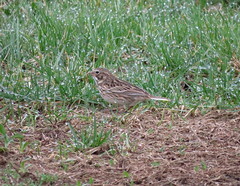 With all the excitement of finally seeing the bird I think I zoomed in too much. I cut off it’s tail in this picture. After this hike I was tired and hungry and wanting to head home. However before I left I had to get a shot of these Tree Swallows . 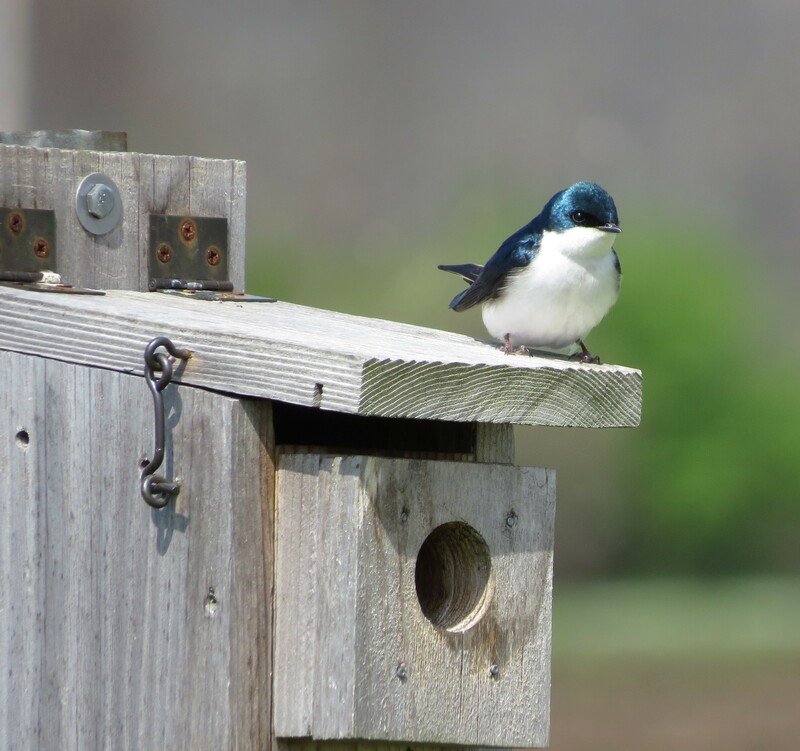 One thing about Tree Swallows is that they’ll sit still long enough to get it’s picture taken. Total species for the day was 55.